Computer viruses and other forms of malicious software can be pretty nasty and usually cause a great deal of havoc when they get onto your system. Some will corrupt or delete files while others attempt to gain access to your computer or steal information. A common disruptive action many malware programs perform is to corrupt or disable a number of built in system options and tools such as regedit, command prompt, msconfig, the run dialog and task manager etc. Basically more modern forms of malware will try to disable anything in Windows that can be used to try and remove it and attempts to protect its malicious actions for as long as possible. Of course, actually removing the malware isn’t such a problem in itself because there’s a wealth of paid or free to use antivirus solutions which are very good at doing the job, or if it’s a nasty infection, using one of the many bootable antivirus rescue discs can also be of great help. After successfully removing the malware from Windows, you still end up with one or several of the registry editor, command prompt, task manager, system configuration utility and folder options still disabled. This is because antivirus software in general can clean and remove the virus but cannot restore the damage done to the Windows settings and utilities. The good news is there are tools around that can restore and repair just about everything that’s been affected by the virus. Our article “8 Tools to Restore Task Manager, Regedit, CMD and Folder Options After Being Disabled by a Virus” has several of the most useful tools around that can help resolve the issues. Not content with disabling things like task manager and regedit, virus creators created new variants of malware that will also totally mess up your folder options advanced settings in Explorer. 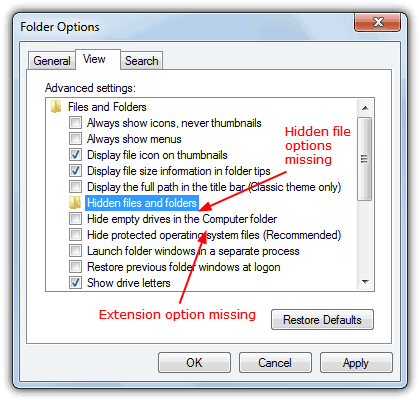 Some of the things that get affected are the “Hide extensions for known file types” or “Show hidden files and folders” entries going missing from Folder Options Advanced settings in the View tab. You can get there by going to Control Panel -> Folder Options -> View tab. There’s other situations where there are issues with the folder options, another one is all the Advanced settings appear to have corrupted or foreign language text, Indonesian being common as several of these types of viruses come from that country. There’s also cases where the Advanced settings have disappeared completely and the window is empty with no options whatsoever. Here you can’t edit anything at all and the restore button does nothing to help either. If the whole Folder key is missing in the registry this will likely be the cause of the completely empty window in Advanced settings, partially missing or corrupted entries will be issues with the individual sub keys that control each option. It’s not easy to manually fix the contents in Folder Options Advanced settings because there are multiple entries for each option, it’s easier to just replace the whole Folder key and reset all the settings to default. What you can do is simply run the registry fix that we’ve exported from a clean and default Windows XP, Vista, 7 and 8 as they all have slightly different Advanced settings. The registry file will automatically delete everything currently in the Folder key and then restore back the default folder options advanced settings. Simply right click and download, then double click and import the settings into the registry. This fix also has an added function that also repairs another issue malware causes which is to actually disable access to the folder options in the first place. 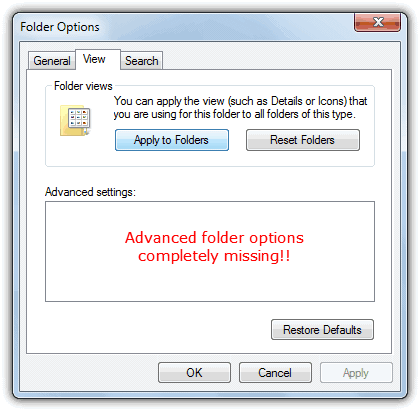 If the Folder options entry is missing in the Explorer tools menu or grayed out in the Organize menu, these files will fix it, you need to reboot for the change to take effect. 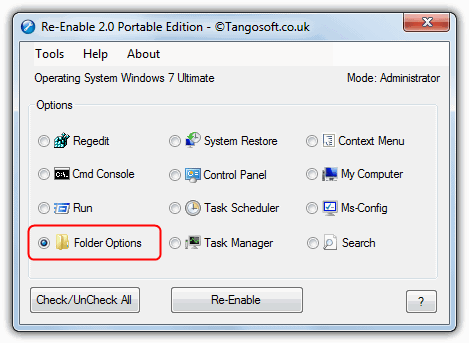 The Re-Enable tool can also do a similar job as the fixes above although you will have to download the 20MB+ portable version or install the program to run the necessary fix. Yes, that helps a lot, thank you so much! Thank you so much for your helpful post. This problem was plaguing me for days and I really wondered how my folder options could look so much shorter than what everyone else was reporting. Keep up the good work! Thank you for posting this information. I think I am on cloud 9…. Hey there Raymond,thanks a bunch for this!Again,thanks a bunch!! Hey Man! Thank you so much for helping me with my prob! Hoping you can help others like me! Thank you so much! I was repairing a pc and the folder options box was empty. This was a life saver! man thank you for reg fix, that was driving me nuts going through nested music folders 5-6 levels deep. and having new explorer pop up everytime! Great program. Thanks for sharing. Thanks a lot for the cure. Excellent work. Thank you so much, Raymond. This is priceless, invaluable information. You already made my day! thank you Raymond, this is very useful article, maybe help me in future. Thanks Raymond. I too have this problem and i already posted a thread “Folder Option – View Tab Language Changed “and i didn’t get a solution for it. Now this post is very useful..
thanks Raymond just what i need to help my friend.